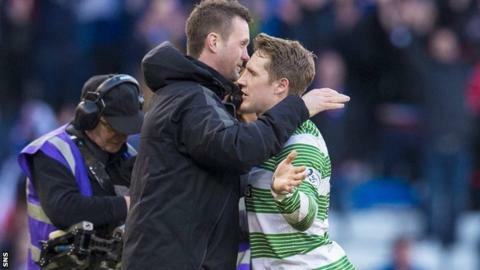 Kris Commons says ending his playing career at Celtic and then becoming a coach at the club would be the "perfect scenario". The 31-year-old midfielder signed a new two-year contract on Wednesday, ending months of speculation about his future. "It's just a special club," said Commons. "There's a special bond between the player and the fans. "I get on with pretty much everyone here and there's no point looking elsewhere when things are going well." The former Scotland international had been linked with a move to Bolton, the Championship club managed by ex-Celtic boss Neil Lennon. However, Commons said he was "delighted" to sign the new deal after having a "little bit of doubt" about whether he would remain at Parkhead. Last season's PFA Scotland player of the year denied that giving his football boots to a supporter after a recent win at Hamilton was his way of forcing Celtic's hand in negotiations. The sticking point had been the length of contract on offer, with Celtic initially keen on only a one-year deal. Commons will soon look to begin doing his coaching badges, although coaching responsibilities are not part of the new contract. "I've got a lot of football to give and I still feel I've got a lot of targets to hit at Celtic," said Commons. "There are certain things that Ronny wants me to improve on and I think that's why I've had a good run in the team - he's seen a different side to what I usually give the team. "Credit to Ronny [Delia] for telling me that he wants certain things done his way - mainly stuff off the ball; a high pressing game and a lot of running up and down the field." Ahead of Celtic's trip to Dundee on Saturday in the Scottish Cup fifth round, the former Stoke City, Nottingham Forest and Derby County player was realistic about Celtic's chances of winning all three domestic competitions this season. "It's very difficult to win the treble," added Commons. "You have to have a lot of luck and you have to be playing well in every single game. There are teams out there that will fancy their chances against us. "If we're not at the races then we've shown this season that we will get beaten. So we have to concentrate 100% on every single game rather than concentrating too much on the glory games."